And so the Buffalo Chicken obsession continues! I've been on a big Buffalo kick lately and this insanely delicious chicken is feeding into my obsession. And I personally think everything is better with bacon so this meal was a win/win! Combine cream cheese, dressing, 1/2 of the wing sauce, and blue cheese crumbles. Mix until smooth. Set aside. Slice chicken breasts through the middle and spread cheese mixture inside. Fold the chicken breast over the cheese and brush top with remaining wing sauce. Wrap the chicken with bacon. Grill over medium heat for 8 minutes per side or until Chicken is fully cooked through and juices run clear. Definitely going to give this one a try! Looks great! 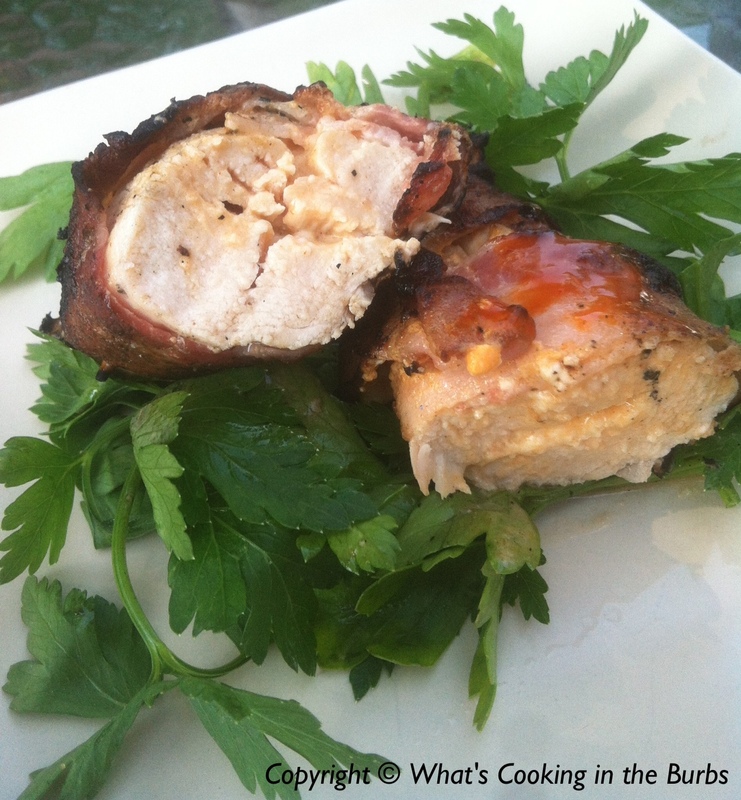 Love the idea of wrapping the bacon around the chicken. Great idea. The filling sounds great too! Great recipe - thanks for linking it to the In and Out of the Kitchen Link Party! Glad you are here! I have tried some variations of this dish and didn't seem to get the balance right. This one sounds like it would have a nice balance. I am going to give it a try! Thanks for sharing at What'd You Do This Weekend.